Often times, when I think of acts of kindness being performed (by myself or others), I think about acts of kindness toward strangers, not those in our own family or in our own home. So while I had limited contact with people outside of my own home yesterday, I did do things that would be considered acts of kindness within my home. The challenge is to do at least one act of kindness per day. 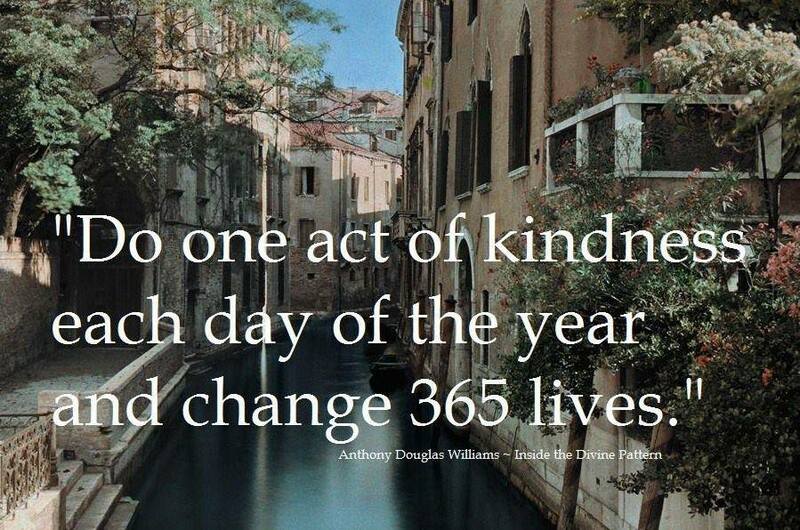 Perhaps we won't succeed in doing an act of kindness to 365 different people throughout a year. But more likely, we will. Maybe part of the challenge is (really) to recognize and give ourselves credit for the vast number of kind things that we actually do. Did you make dinner for your family last night? Did you wash, dry and fold their laundry the other day? Do you go to work every day so that you can help support your family? I realize those can all be attributed to being kind to yourself. Depending on your life view, you could be thinking that those are entirely selfish and shouldn't count. But they do. And it also counts when you're kind to yourself. Stressed and in desperate need of relaxation so you take a bubble bath? Count that as a kindness toward yourself. My challenge to you is simply this: be mindful of the acts of kindness that you perform every day. The stray you fed. The friend you lent a shoulder to. The child you bought coffee for. The dinner you cooked for your spouse. The firewood you chopped for the fire place to keep your family warm. Focus on the positive things you do. Recognize them. Even the little things. Let's stop taking those things for granted, and let's celebrate those around us for what they do. Let's celebrate ourselves for what we do. Let's focus on filling our world with gratitude.